Kinton Ramen is truly a hidden gem tucked away beneath the hustle and bustle of Kennedy Commons. 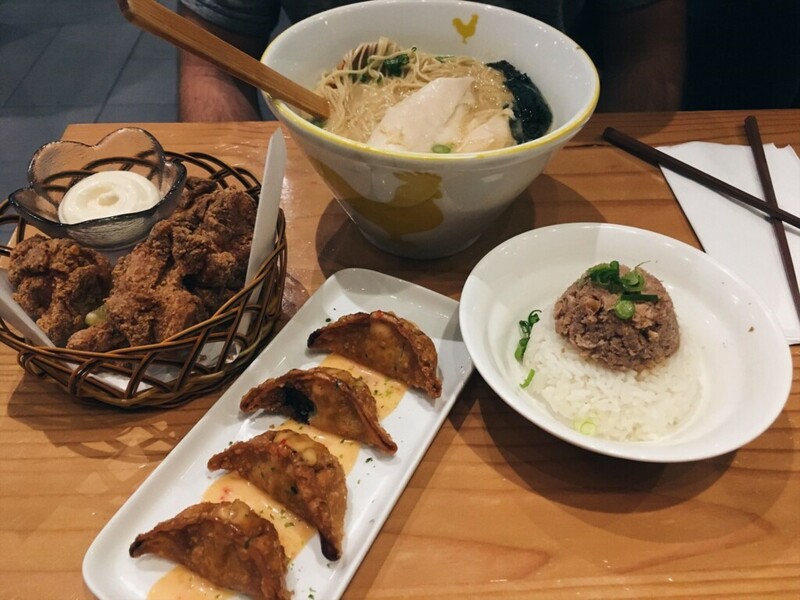 Located at 1 William Kitchen Road, Kinton Ramen offers more than just a hearty bowl of delicious ramen. You can expect a selection of hot and cold tapas, rice, desserts, and specialty drinks to complete the menu – including sake! This authentic Japanese ramen bar opened in Toronto over 6 years ago and was one of the first of its kind to lead the path to delicious, customizable ramen bowls. Infamous for its loud and friendly greetings as customers enter/leave, Kinton Ramen is not the place for those looking for a quiet sit-down dinner. With communal style tables and a standing bar (tachinomiya), the atmosphere at this Japanese ramen bar is vibrant and fun. Throughout our visit, the servers were attentive and were even decked out in Halloween costume to match the occasion and spooky décor. There’s no doubt that our casual weeknight dinner turned out to be a memorable one. corn, egg, seaweed, bean sprouts, nori, etc). You can also opt to get extra pork or chicken which fills up your ramen bowl with 3x the regular portion! For starters, we ordered the Age Gyoza (pork dumplings deep-fried to perfection revealing a crispy outer layer with a warm pork filling on the inside, accompanied with a flavourful sweet chili sauce), Ton Ton Don (chopped pork seasoned with Kinton original sauce on rice), and the Original Karaage (fried chicken with garlic mayo). We shared a bowl of the Chicken Shoyu ramen featuring soy sauce, tender chicken breast, onion nori and scallion. It’s safe to say we were incredibly impressed with all our selections, especially the gyoza’s. Each location also has their own special menu featuring a bowl of ramen specially designed with its customers in mind. Kennedy Road’s specialty: Spicy Gyokai Cold Ramen – thick noodles in a chilled fish and vegetable broth with pork shoulder, half a seasoned egg, spinach, jalapeno paste, green chili, nori and finished with lime, sesame seeds, and scallion. As for a loyalty program, Kinton Ramen offers a Kinton Bowler rewards program allowing ramen enthusiasts to collect prizes based on the amount of Kinton Bowls consumed. Prizes include 10-pc Gyoza, Kinton towels, bowls, and t-shirts, and gift cards worth up to $1000. You heard that right, the more you eat, the more you win.